In the second entry of our lifestyle series, we worked with a few ideas on place settings. We took the idea of incorporating nature and textures and mixed it with flatware adding some fun to the place card concept. We loved the idea of weaving herbs and floral into the tablescape as a whole. As you can see from the first photo, we took a single sprig of rosemary and the simple yet beautiful Michelangelo flatware and tied them together with a rich velvet ribbon, setting them on top of a crisp, off-white linen napkin. If you follow color and design trends, we have big news. 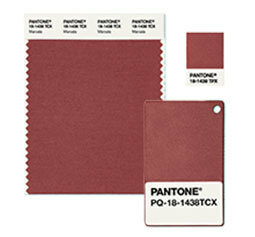 Pantone has announced the color of the year for 2015! And we are happy to see that their choice was very Italian! Anyone can make a reservation at a restaurant. It’s convenient. A dinner date at a restaurant requires minimal planning and not much effort. Finding parking might be the biggest challenge you’ll face all night. And while we are all for convenience, isn’t there something much more romantic about making an effort? Ready for something totally unexpected? The trademark of Modigliani is a respect for the past, an appreciation for the romanticism of the simplicity of Italian life. Most of our designs look to the past for inspiration. This one is really special because it looks to the future. My New Year’s resolution? To get better at keeping secrets. Because there’s something I’m excited to share with you, but I can’t yet! The best thing about the New Year is that it is a time to focus on renewal. It’s a fresh start. You get to make resolutions, maybe take a yoga class or work on kicking a bad habit. The New Year is a time to take advantage of new opportunities. Returning to the Nest: College Kids Coming Home for the Holidays! With Christmas finally behind us, the pace has slowed down (a little) around here! It’s been great having family back home, especially now that that the holiday rush is over and we can spend more time outside of the warehouse. Out of the darkness of winter, we choose to make light. This Sunday is the winter solstice. It is the shortest, darkest day of the year. The sun rises late, sets early, and night lingers longer. So at this time of year, it’s dark when I leave for the warehouse in the morning and dark again by the time I get in my car to drive home.